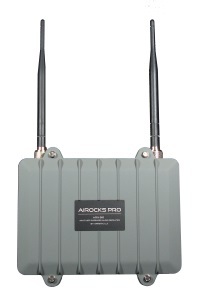 Note: The AiRocks Pro system is currently certified for use only in the USA and Canada. The ARX-900 is designed for Mobile Sound Production companies to be used in concerts, festivals, parades, air shows, sporting events, and any other outdoor (or indoor) event that requires a temporary installation. Its long list of pro-audio features, such as standard XLR input/output connectors, 500 msec variable delay (per hop), Neutrik AC power input, 2-channel stereo operation, and road-ready, weather-resistant aluminum chassis, makes it the perfect choice for the mobile audio production engineer. It is truly "Road-Ready Radio"! CLICK HERE for more details on the ARX-900. The NEW ARX-910 is designed for Permanent Installations (Installed Sound) which require constant, prolonged exposure to the elements such as downtown districts, zoos or parks, outdoor arenas, or a large campus. The ARX-910 comes in the same rugged cast aluminum chassis as the ARX-900, but does not have front panel controls and is fully weather proof. The same "repeater" architecture and performance are designed into the ARX-910, and the ARX-910 can utilize the same, powerful USB-connected network management system as the ARX-900. The ARX-910 operates on 12VDC, can be wall-mounted or pole-mounted, and can operate over temperature ranges from -40C to +85C. CLICK HERE for more details on the ARX-910. 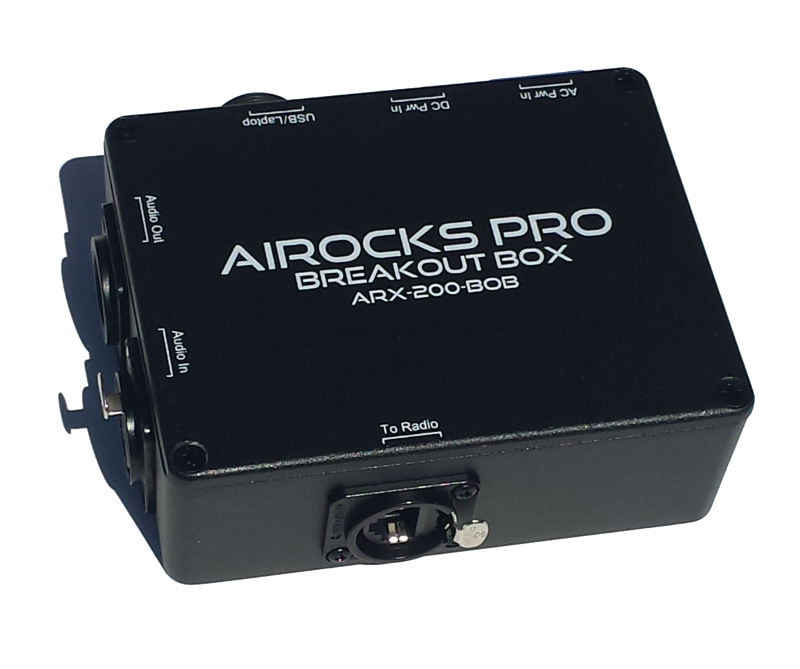 Breakout Box for ARX-900. Typically used with the Master unit, the BOB allows you to mount the ARX-900 radio high on a pole or truss and bring all of the connectors down to the ground via a CAT5 cable. The ARX-900-BOB provides a USB interface for your laptop connection and includes the Network Management Software for PC. CLICK HERE for more details on the ARX-900-BOB. USB Extender is designed primarily for ARX-910 configuration and control. It is the functional equivalent to the ARX-900-BOB but in a much smaller (2.5" x 1.5 "x .75") plastic case. Includes audio input/output connector (1/8"), and DC power input connector (5.5mm x 2.1mm) so that radio can be powered by external AC/DC wall adapter. Also includes A USB interface for laptop connection for the Network Management System application. The USB interface powers an internal 5V to 12V boost converter that provides power to the ARX-9xx radio so that no external AC power is required. This particularly helpful during initial installation and network debugging. 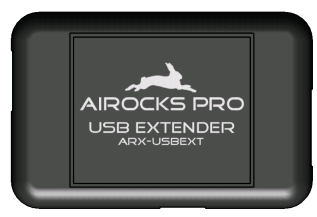 The ARX-USBEXT includes the AiRocks Pro Network Management Software. CLICK HERE for more details on the ARX-USBEXT. 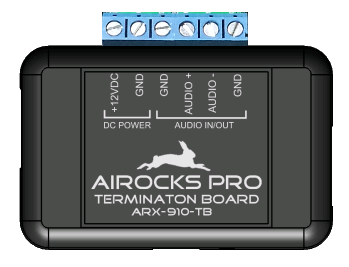 Provides audio and DC power terminal block for the ARX-910 radio. Also provides an interface for the ARX-USBEXT for on-line configuration and control. One ARX-910-TB is included with each ARX-910-KIT. 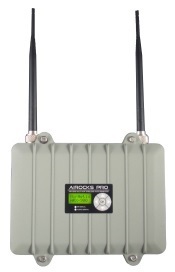 Although designed primarily for the ARX-910, the ARX-910-TB is also compatible with the ARX-900 radio. CLICK HERE for more details on the ARX-910-TB.